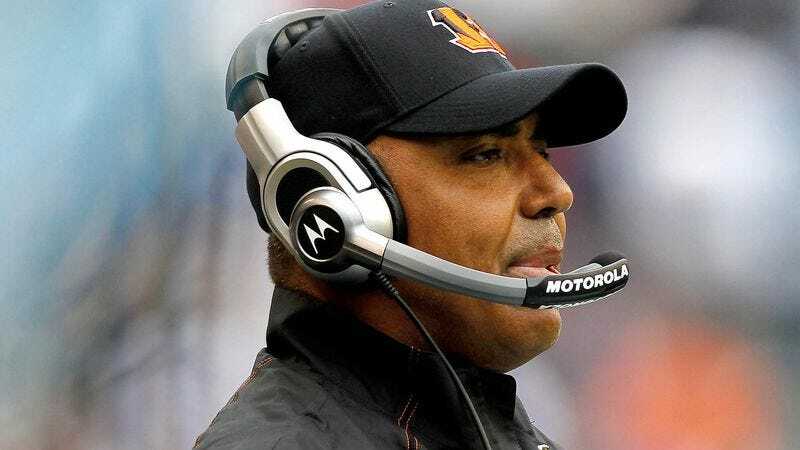 CINCINNATI—Bengals head coach Marvin Lewis was immediately placed on suicide watch by city authorities after achieving his franchise-record 65th victory with the team last Sunday. “The fact that he’s tallied 65 wins with the Bengals means he’s been miserable for a long time, and in enough pain to plunge any person into a deep, suicidal depression,” Cincinnati police chief Daryl Rowan told reporters during a press conference, adding that the majority of suicides in Cincinnati can be linked back to the victim’s association with the Bengals. “Lewis has been put through so much turmoil—from Mike Brown’s terrible decisions to Cedric Benson’s multiple arrests to last year’s 4-12 season to having to deal with Carson Palmer for so damn long. After all that, it’s a shock he isn’t hanging from a ceiling beam somewhere already.” Moments after the press conference, Police Chief Rowan was found dead and, in a suicide note, claimed that discussing the Bengals that long had been too much for him to handle.